When patrons come into Art & More they go immediately to the creations of Larry Wear. He is an important part of everything that happens at the gallery. Larry loves creating and he enjoys spending time with fellow creators. 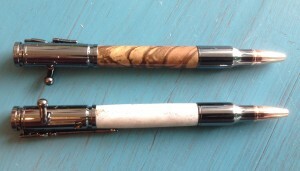 This led us to open our art gallery in 2012 and soon after to Larry’s fascination with creating his pens. He has since added knives to his creative endeavors and he spends a big portion of his time in his basement workshop, his man cave. His patrons are able to enjoy many unique one of a kind creations produced in that workshop. They enjoy looking, touching, and admiring his creations as he showcases them in the gallery and at numerous shows across the state. 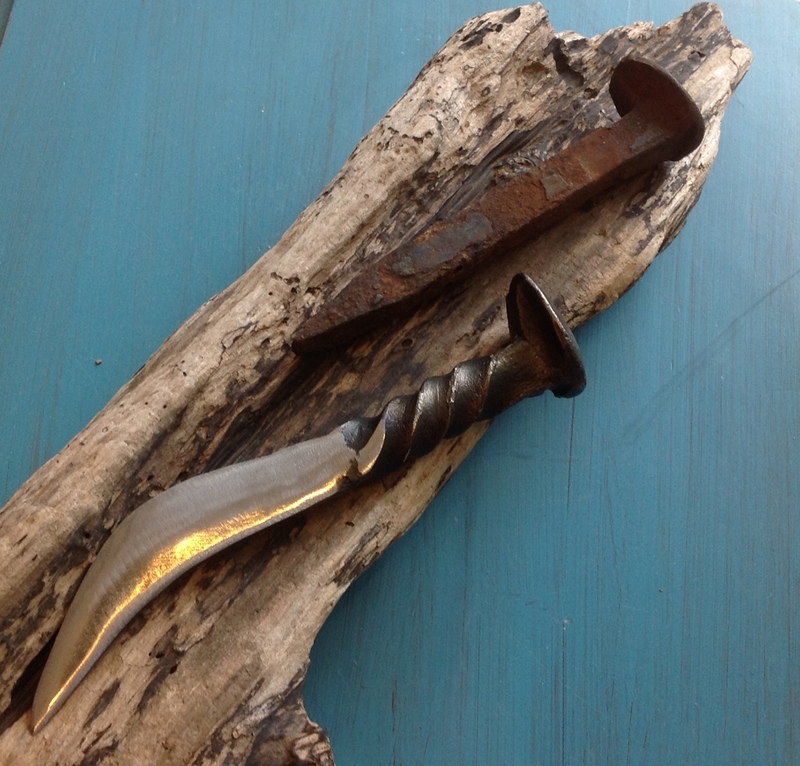 Repurposed railroad spike to Beautiful knife. 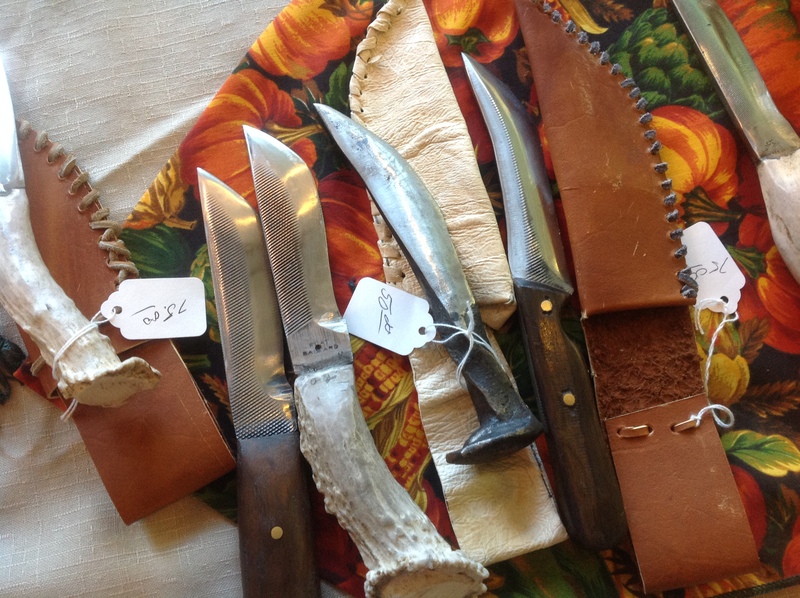 Among Larry’s most popular creations are the knives he crafts from used and discarded railroad spikes and he has a hard time keeping enough of these in stock. Those who have worked with, or who do work with a railroad company find these beautiful knives irresistible. In addition to the railroad spike knives, patrons are able to choose from a unique collection of knives created from carbon steel that would otherwise be discarded. They are amazed that the metal has been repurposed in such a magnificent way. 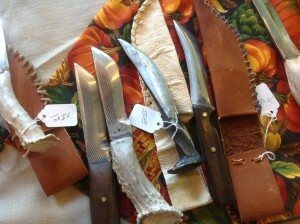 Soon after Larry began creating knives, he began creating sheaths for each of them. He cuts and laces genuine leather pieces to create a sheath that perfectly fits each knife. The combination of knife and sheath makes a perfect gift for any person who appreciates and enjoys hand crafted creations. 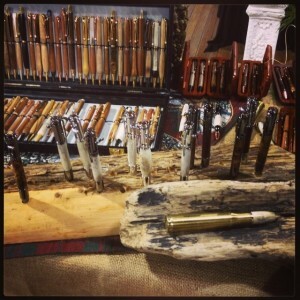 Those who shop Larry’s collection are fascinated with the collection of hand turned pens fashioned from antler bone and the finest of woods, both local and exotic. 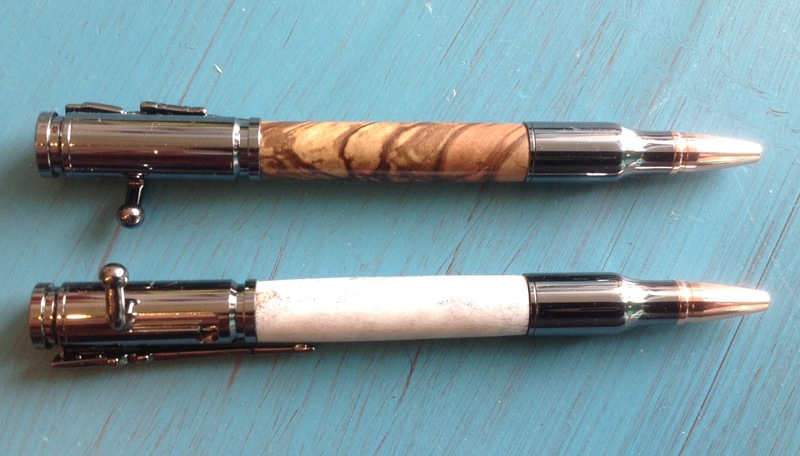 The bolt action pens are refillable and use a parker refill, making them as functional as they are beautiful. The slim line pens are practical and beautiful and are refillable using a cross refill. There is a continual adding of new styles to the selection and either of Larry’s creations is destined to become a prized possession of the recipient. Some of the favorite things for Larry are the commissioned projects he is privileged to craft. It gives him great satisfaction to be able to take antlers inherited from a deceased relative or wood from a family barn or home and create beautiful keepsakes for family members and friends. When a pen or knife handle comes from such a sentimental source that is pretty special. Patrons are always impressed with additions to Art & More’s gallery from the man cave. There are bowls and cutting boards, along with frames and backings for our art. This man is a crafter and there is no way to predict what will come next. We are very happy that he is out of retirement and is crafting such beautiful creations. And, we do know we will keep him and continue to be excited each time he presents a new creation. Creations by Larry are found in our Art & More Gallery and he does accept commissions.